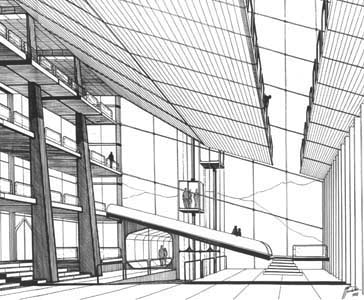 Patricio Pouchulu (Buenos Aires, 1965) received his architectural training with Sir Peter Cook at the Bartlett School, London, United Kingdom, graduating in 1998 as Master in Architectural Design M.Arch, at the UCL, University College London. 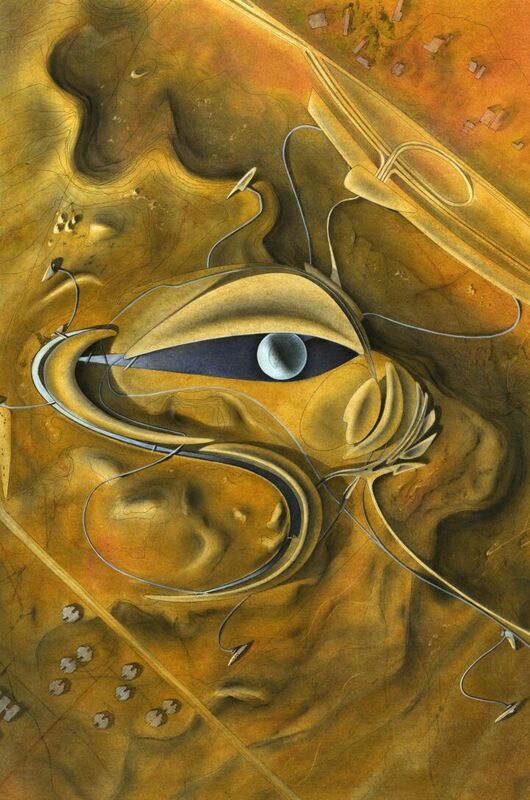 He was recognized by the British Council & Fondo Nacional de la Artes Scholarship (1997). He got his first full architecture degree from FADU, UBA, Universidad de Buenos Aires. Since 1981 Pouchulu has produced more than 170 architectural projects. He applies organic principles, with emphasis on flexibility, re-instating classical architectural concepts (proportion, escale, materiality). His body of work deals with a wide range of topics, themes and places. Cities: London Bridge Project, Ciudad en el Desierto; Nature and Architecture: House in a Cliff; Resting & Leisure: Bond House, Blau Hotel, Mirador de Atardeceres; Offices: The Lift; Theatres: Kalevala; Museums: MNBA, Grand Egyptian Museum, Giza. He taught in Germany, UK and Argentina, currently attending juries and lecturing. He transformed buildings in London, mostly in conservation areas, teaming up with English and German engineers. Pouchulu is married to Vanessa Oliveira, performer, musician and linguist who collaborates in interdisciplinary researchs. The MNBA, Museo Nacional de Bellas Artes (National Gallery), holds the biggest art collection in the Southern Hemisphere (13.000 art pieces, 3.000 fine canvas), but holds unsolved urban and architectonic problems. In 2000 its former director Jorge Glusberg asked Pouchulu a concept to expand the building. After a few months, he presented a large underground extension and a new access. First, the entrance was relocated across Libertador Avenue in Plaza Francia, through a Crystal Dome over the extraordinary French monument. By doing this, the museum will attract a percentage of the 250.000 visitors that visit Recoleta every day. Second, the new space is located under Libertador avenue, showing the 20th and 21st Century collections. The existing Museum, an old pumping station transformed in 1932 by Alejandro Bustillo, is left intact and will host the 19th century and pre-Columbian art. Third, by placing a large car parking complex, art shops and amenities, the museum will become sustainable. The scheme includes restoration and conservation rooms, an auditorium-cinema, interactive areas and a Piazza-cafe. The Bamiyan Cultural Centre is a bridge, because it connects past and future, allowing visitors to walk on its roof, reaching the great Buddah Cliff view in permanent dialogue with the valley's history. The building develops a single space, following the rich sheltered bazaar typology: this honours one of the most important eastern anthropological qualities that explains the islamic spirit: the journey. A grand amphitheater, articulating the upper and the lower site levels, transforms the Valley in a natural stage. After passing the gate, visitors walk by the 34 Provinces Park, reaching the columnated lobby, hall, Performing wing, Amphitheater (outdoors), and Exhibition wing. 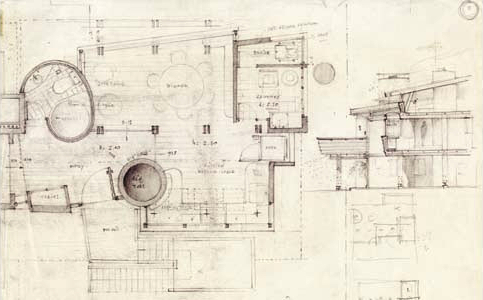 Visitors submerge in a trip, softly descending through exhibition terraces: Information, Tea House (Glass Cube), Permanent Exhibition, Research, Library, Quiet Rooms, finally reaching the lower level with temporary collections; there they watch the Buddah Cliff -mirrored on a water pool- through the large curved window. Perspective, Cyclotel unit in the Netherlands. Copyright © 2018 Cyclotel Holding B.V. The Cyclotel concept was created by Pouchulu in 2007. After a long research it started to be developed in 2012. It is the first shelter chain in the world to exclusively serve cyclotourists. Each unit is placed along cycling routes. The Cyclotel offers a different, new way of visiting Europe while cycling, introducing the idea of green holidays, creating short, medium or long-range trips in specialized hotels where cyclists can sleep with their bikes. Bicycles are 100% eco-friendly… represented here in a 100% green building: the first off-grid industrialized architecture network. 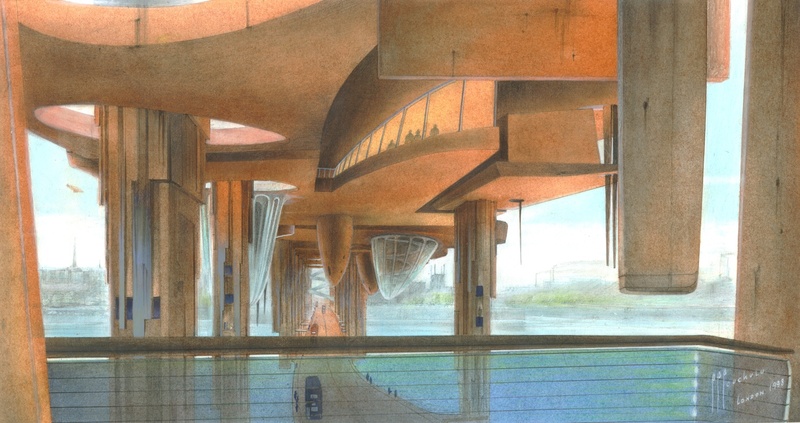 Renders, Cyclotel variations, by T/U Eindhoven Unversity, Engineeing Students, the Netherlands. Copyright © 2018 Cyclotel Holding B.V. In London, most contemporary architecture is hidden behind old Victorian buildings (1837-1901). The Black Horse from Kentish Town -dated 1865 and a Public House since 1775- comprised a traditional Pub in the ground floor, two floors with eight bedsits (single temporary letting rooms), a maisonette and three studios at the top in the Mansard. Middle flat, living and access, photo from mezzanine. Copyright © 2008 PPPouchulu. With great emotional and technical difficulty, the Pub was converted into three flats, the first and second levels were optimised, the maisonette was transformed into a four bedrooms flatshare (photo, left wing) and on top of the building a new proposed loft (photomontage) will capture the magnificent views of the centenary Plantans trees from across the street. South flat, entrance porche, living's corner with original Pub's windows, master bedroom. Copyright © 2008 PPPouchulu. After meeting Camden Council planners (the building is surrounded by a Conservation Area) the client was granted planning permission for building three new flats, completed in 2008. The top floor will be made of a pre-made steel structure wrapped with wood with a long mirrored window, placed on top with a crane without demolishing the existing Mansard. 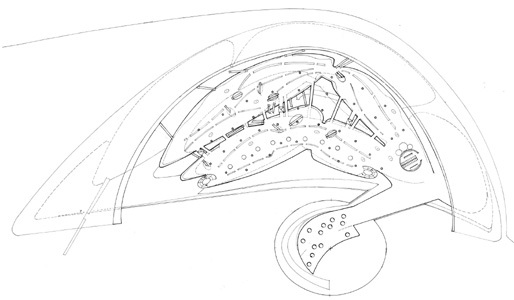 Perspective at bird's eye, showing main exhibition space, bubble-access, infrastructure buildings, Dunal Park. Copyright © 2002 PPPouchulu. This is perhaps the most interesting competition in the first years of our new millennium: a project for the biggest museum worldwide, entirely dedicated to Egypt, just behind the Giza Pyramids. The GEM is more than a museum: it is a statement about Mankind and the Universe, as it will keep and project the treasures of our past into the future. The GEM is part of the desert and the sky: forms are curved, following the sun. It is a World, because in Old Egypt every form had a relation with the Cosmos, something we have lost. Perspective, site, showing Eye-Space, bubble-access in lake, infrastructure buildings, Dunal Park. Copyright © 2002 PPPouchulu. The whole project is inspired in the forms of the desert and the profile of the dunes. It is organised as a suburban "garden city": a network of streets, piazzas, bridges and shells are placed surrounding the Dunal Eye, which contains the main exhibitions platforms. Internal perspective,exibition platforms looking at the Giza Pyramids. Copyright © 2002 PPPouchulu. The Pyramids can be seen from every exhibition area. The inner space is defined by thematic, chronological and hyper-textual routes; different platforms are linked by bridges, lifts and escalators. Outside, a single and long curved-building contains the Conservatory, Library, Mediathequ and other resources. The main piazza is in between the Eye and a group of large spaces: auditorium (extendible with three smaller conference rooms), temporary exhibition spaces and commercial areas (restaurants, shops, leisure). Plan, Dunal Eye, level 1, access level from Bubble (ink on film) Copyright © 2002 PPPouchulu. Perspective at bird's eye, London Bridge over the Thames. Copyright © 1998 PPPouchulu. A City within a building on a bridge: that resumes the main idea of this ambitious project, linking north and south of London. 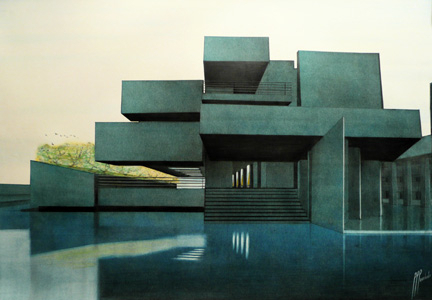 Architecture becomes a transitional state between sky and water. On the main platform, several bubble spaces point the dramatic skyline; underneath, hanging glass-domes try to reach the water. It stands 65 metres over the Thames. Perspective, the platform's belly, columns-flats and the Road Bridge over the Thames. Copyright © 1998 PPPouchulu. This dialogue between light and space is the leitmotiv of this living bridge. It is organised along a main street, from where it is possible to see London from above for the first time. 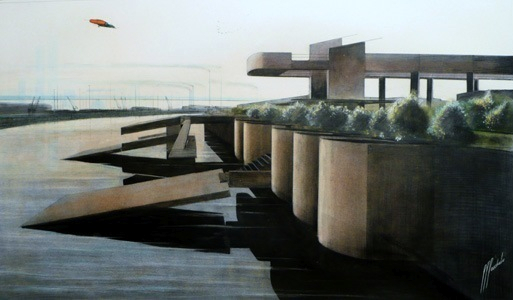 Cross Section, the Platform, Linear City, Columns-Flats, Road Bridge, Tentacles (ink on film). Copyright © 1998 PPPouchulu. 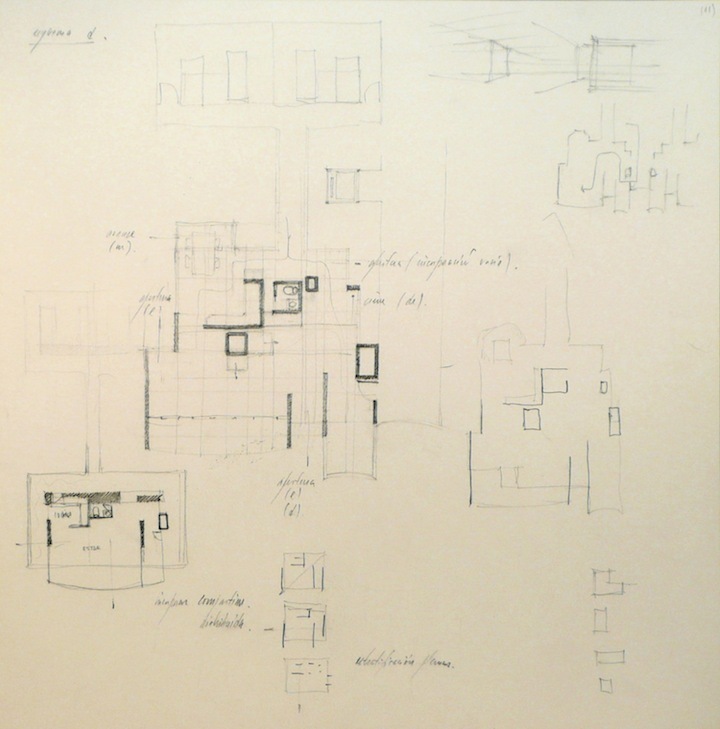 Plan, level under main linear city (ink on film). Copyright © 1998 PPPouchulu. The idea of an alternative pedestrian urban spaces over the roofs transforms the scheme in a kind of urban machine, exploiting a different dimension. Perspective at bird's eye. Copyright © 1994 PPPouchulu. This house is located in front of the ocean in a long cliff. The surfaces are clear and flat. It is a mushroom-like object, a sort of floating structure. Undoubtedly it has a Victorian spirit. The plan's geometry is based on both radial and spiral patterns. The entrance is in the middle level; the kitchen and two bathrooms are integrated within the rock; a great fireplace dominates the main living space. Perspective at bird's eye, East side. Copyright © 1994 PPPouchulu. View from North-East, early evening in Spring. Copyright © 1992 PPPouchulu. This house is built in a marvellous natural place covered by exuberant vegetation and forest, about 30 miles from Buenos Aires. It has two levels: public areas in the ground floor and private in the first floor. An extension, not yet built, will extend the upper floor towards the north (best orientation in the southern hemisphere). Preliminary plan for West extension. Copyright © 1992 PPPouchulu. The views get into the space, bringing surrealistic greenish light inside. In September (spring) the whole garden blooms: millions of flowers invade the space with blue, purple and red reflections. View from North-East, mid-day in Spring. Copyright © 1992 PPPouchulu. The construction is made of insulated light bricks linked through reinforced concrete horizontal rings. The roof is made of selected hard and semi-hard timber (Lapacho, Incience, Virapita) as all the transitional spaces like the front and back balconies. Front balcony made of Incience timber, mid-day in Spring. Copyright © 1992 PPPouchulu. View from North-East, early evening in Spring. Copyright © 1986 PPPouchulu. This project looks for innovative ways of placing sport facilities in town. Actually, it is a concentrated urban outdoors project, a statement of territoriality: the whole complex is set as a series of mass' projections into space, land and river. 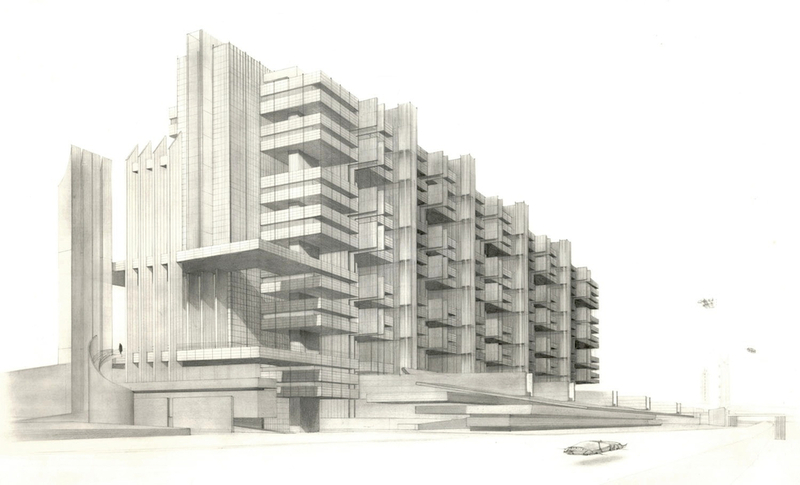 The building explores as well the rational use of megastructures, taking the form of links, bridges, ramps, platforms. This project shows the idea of narrative mass. Every part, every detail is expressing itself as an individual piece of an architecture that literally tries to fly, extending into surreal spaces. Perspective, East entrance to Residences. Copyright © 1986 PPPouchulu. 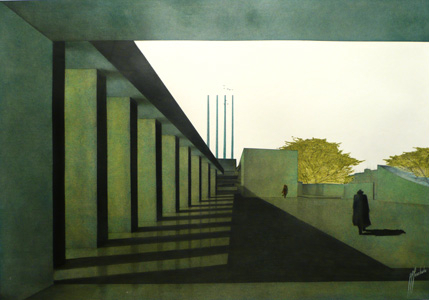 The drawings show a quiet but intriguing space, somehow they guess about a closer future in a sort of "post-apocalyptical" way: greenish and bluish glossy concrete and steel surfaces appear in backlight, expressing a desire for an eternal existence. Perspective, under the pier, early Winter morning. Copyright © 1986 PPPouchulu. Bird's eye axonometric (pencil on heliographic copy from ink on tracing paper). 3m x 1.1m Copyright © 1992 PPPouchulu. Perspective from South-East (pencil on Canson). Copyright © 1986 PPPouchulu. This high-rise building explores the spatial condition of a large structure and exploits the idea of detailed morphologies: the combinations of single elements shows a world of tectonic architectural shapes. Sometimes these forms are strongly set as hanging plates or floating decks, others as repetitive formalistic signs and industrial pieces. The building reacts as an organism: there are specific devices, like a sophisticated air-flap system included in between the pod-flats, designed for controlling the air condition and ventilation of the whole interior. Preliminary drawings, Gaboto I (pencil on Conqueror). Copyright © 1986 PPPouchulu. This project was developed in two versions; the first one (shown above) evidences a somehow rough appearance, but nevertheless belongs to a futuristic vision; the second is more descriptive: it reminds of a delicate and powerful musical composition, sort of architectonical puzzle. Perspective of interior space towards the West. Mountains in the foreground. (ink on canson). Copyright © 1983 PPPouchulu. This generous interior public space of an office building shows the need of expressing architecture in terms of space. The elements have been placed in a rational but free way. The transparency of the hall is expressed in the curtain-wall and in the verticality which goes up through the ceiling's gap. Structural forms fill the borders: triangular large pillars and flat platforms at the left, a textured wall at the right. The mountains profile behind the glass points the romantic condition of the space. Pouchulu was here seventeen years old.